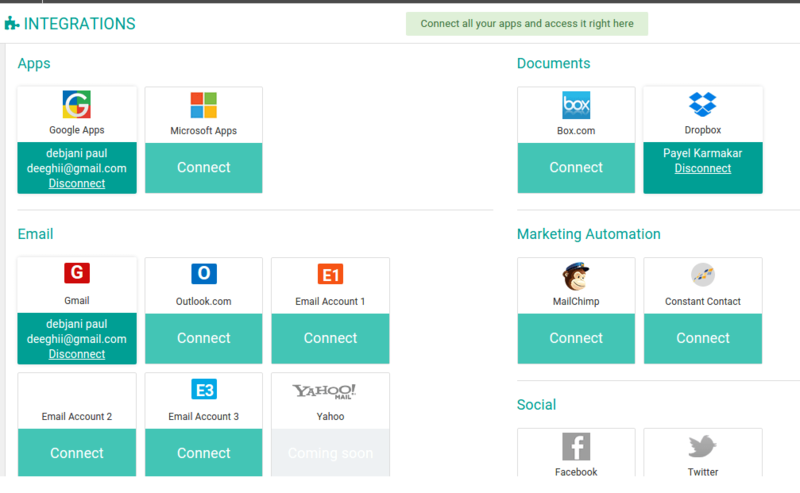 ZipperAgent provides a seamless interaction with a number of external apps that you may be using. You can integrate your Google account, Microsoft account, Email Exchange servers, Dropbox, Box, Constant Contact, MailChimp etc. with ZipperAgent to access and use the services directly from inside your ZipperAgent application. 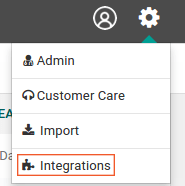 Integration can be initiated from any page in ZipperAgent by clicking on the Integrations option from right top menu. Google Apps is a subscription-based product suite from Google. By enabling Google Apps integration with ZipperAgent, you can seamlessly use your Gmail account for emailing, linking files in Google Drive and Google contact and calendar sync. Click on the Google Apps button, it will open a dialog prompting you to enter your Google account login details. If you are already logged in to Gmail from another browser the dialog will ask for your permission to proceed. Once the login is successful, you Google account will be automatically integrated to ZipperAgent. 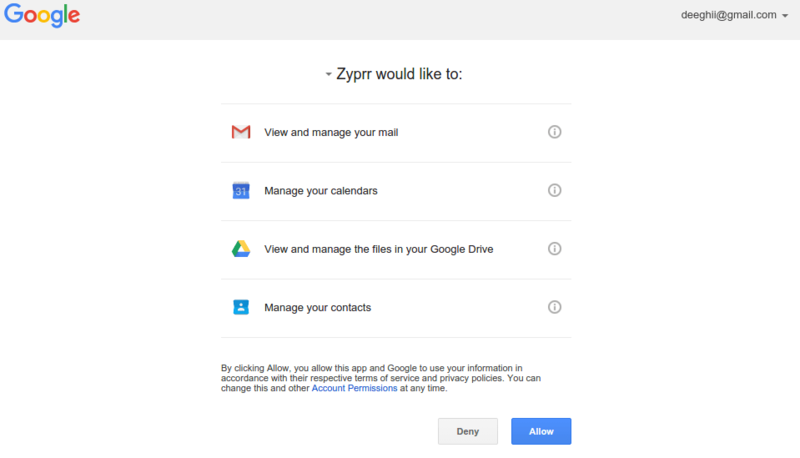 ZipperAgent will ask for your permission to allow it to import your Google contacts automatically. You can see a new tab on top of the page in Email module of ZipperAgent with your integrated account. You can see all your Gmail account emails here within ZipperAgent and reply from there. You will also see the newly added Google account as your optional email source while composing an email from anywhere within ZipperAgent. 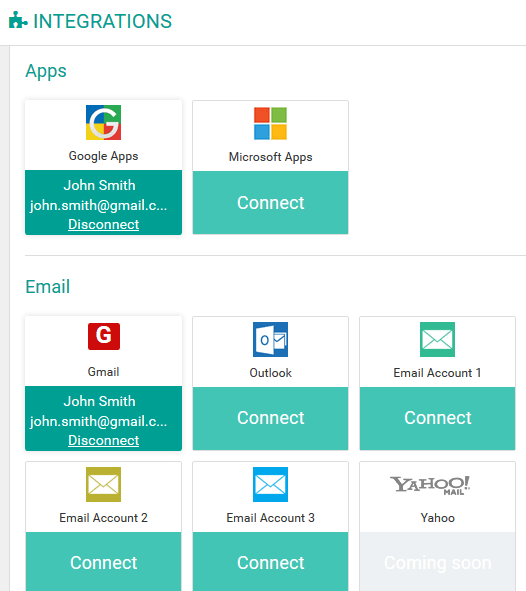 By enabling Microsoft Apps integration with ZipperAgent, you can seamlessly use your Microsoft account for emailing, linking files in One Drive and Microsoft calendar sync. Click on the Microsoft Apps button, it will open a dialog prompting you to enter your Microsoft account login details. If you are already logged in to your Microsoft account from another browser the dialog will ask for your permission to proceed. Once the login is successful, you Microsoft account will be automatically integrated to ZipperAgent. ZipperAgent will ask for your permission to allow it to import your contacts automatically. You can see a new tab on top of the page in Email module of ZipperAgent with your integrated account. You can see all your Microsoft account emails here within ZipperAgent and reply from there. You will also see the newly added Microsoft account as your optional email source while composing an email from anywhere within ZipperAgent. You can link your files from any of the integrated external document services into ZipperAgent under Contacts, Opportunities, Properties and Accounts. On Integration page, if an external service is not connected yet, it will show a “Connect” button. On click of the Connect button, you will be prompted to log in to the service. Once you’ve entered your credentials for the service or if you are already logged in to the service on another tab you will be connected to your account. Once the account is integrated, you will see the integration details (account name) on the icon. Note the name “Will Smith” appearing on the Dropbox service icon in the above picture as the same account has been integrated with ZipperAgent. In case you want to disconnect any of the services from ZipperAgent, then simple click Disconnect button associated with every connected service icon. With ZipperAgent Email Integration gateway you can connect with any number of email accounts to your ZipperAgent application. If your email is hosted in Gmail or Outlook then it’s just a click away to integrate the same. Click on Gmail box or Outlook box under “Email” section. An authentication dialog will open. Type in the user name and password of your email account and voila! After successful integration of your email account with ZipperAgent, any email sent from ZipperAgent will have an option to choose the “From email” address which is a list of your integrated email accounts along with default ZipperAgent email id. If you are having an exchange server or want to do a manual configuration of your email account, then click on any of the “Email Account 1”, “Email Account 2”, “Email Account 3” boxes and enter your login details followed by the Incoming and Outgoing server details. Once the email account is successfully added, it will appear on the Email page as a separate tab. The 'Local' tab always comes as it is associated with the default ZipperAgent email id. You can integrate your MailChimp and ConstantContact accounts with ZipperAgent as part of your marketing automation integration point. Log into your MailChimp account and navigate to the API Keys page. If you have a key in your API keys list, copy the key (it’s a long string of alphanumeric characters). Now, in ZipperAgent Integration page, click on the MailChimp box. It will ask for the MailChimp key, paste the above found key in the dialog, click save and voila! Your MailChimp account is now successfully integrated with ZipperAgent. 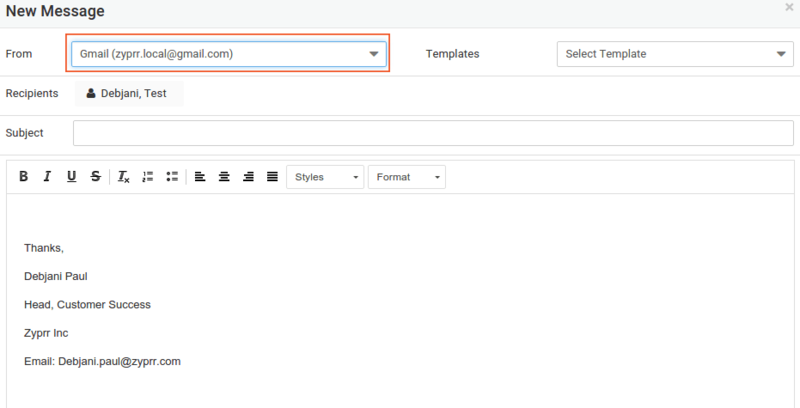 Now you are able to export Contacts from ZipperAgent to any of your Mailchimp lists and run campaign. Campaign results will be reviewed within ZipperAgent. Check for the campaign details under “Marketing” tab of details page of a Contact. On ZipperAgent integration page. Click on Constant Contact box. The ConstantContact login window will appear, enter your ConstantContact account details. 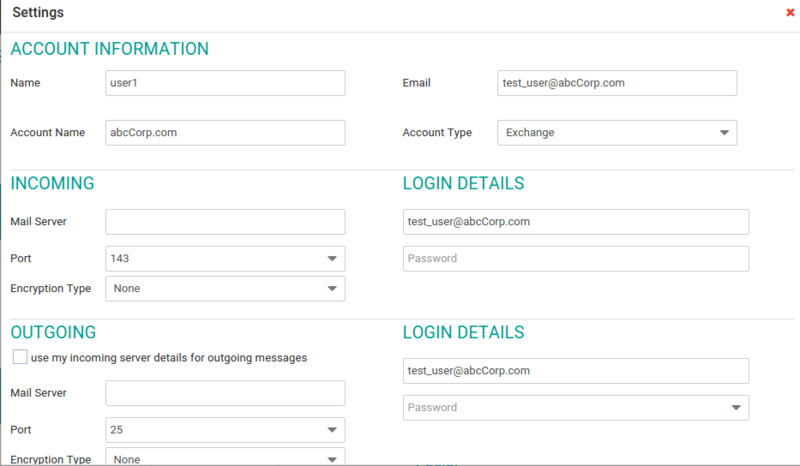 After successful integration of your Constant Contact account with ZipperAgent, you will see your ContstantContact login name is appearing inside the Constant Contact box in the integration page. Now you can export contact list form ZipperAgent to ConstantContact and run your campaigns in ConstantContact. The result of the campaign can be seen in each of the selected contacts for the campaign. 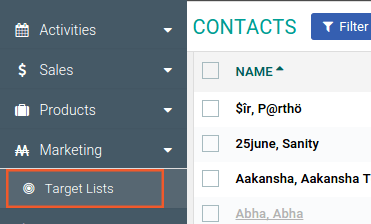 To create an export list to Constant Contact, go to Menu -> Marketing -> Target Lists. 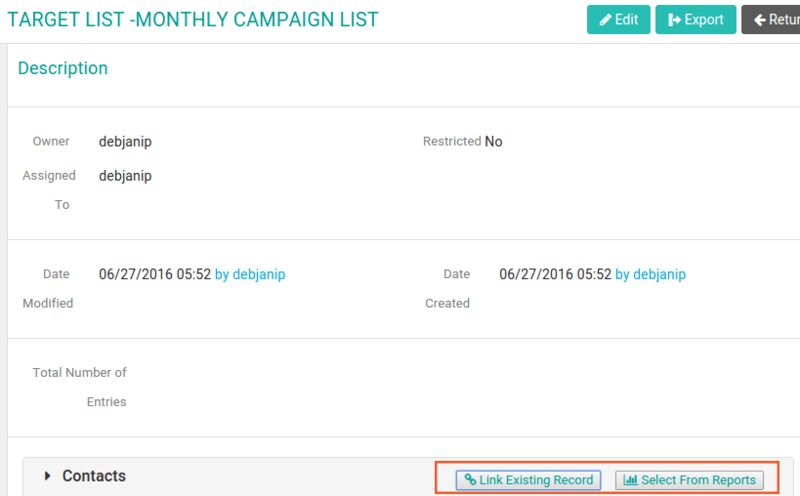 Create a new target list and then link Contacts from ZipperAgent. You can select individual contacts or take output from a previously saved report on Contacts in ZipperAgent.